Everybody loves all-terrain vehicles. These vehicles are powerful and loaded with a lot of advanced features. It can take you to places that no regular vehicle can. Its 4-wheel drive makes it possible to climb rough and uneven terrains. Imagine getting a robotic pool cleaner that can go above and beyond your expectations, cover hard to reach places and vacuum all the dirt on your pool, from smallest particles to the largest leaves. 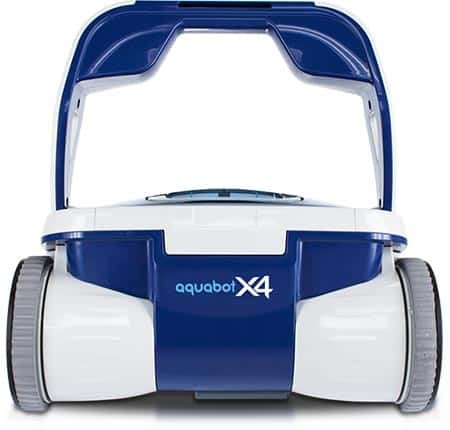 If there is a robotic pool cleaner that carries all the superlatives, it must be the AquaBot X4. One of its primary features is the finest filtration system. The AquaBot brand is known for its 2-micron filtering performance and they are an industry leader in this aspect. Bacteria are as small as 2 microns, that means its microfilters can trap pollen, dust, dander and other smaller particles. This feature is complemented by two ultra-fine filter baskets that can hold 190 cubic inches of dirt, sand and leaves. The built-in pump on the AquaBot X4 can promote better water and chemical circulation on the pool at the rate of 85 gallons per minute. That means chemical residue is less likely, dirt and debris are vacuumed and clean water comes out of the pool vacuum’s filter. The suction intake at the bottom of the pool cleaner is adjustable so it can be closer to the pool floor and increase suction capacity for smaller sediments. A programmable power supply that comes with this robotic pool cleaner conveniently allows you to set the cleaning cycles between 1, 1.5 or 2 hours. You can also automatically set the cleaner to run every 2, 3 or 4 days. It also gives a warning once the filter is full or dirty. Manually brushing your pool’s waterline will also become a thing of the past with this pool cleaner. It is equipped with an advanced rotating micro-brush that will surely loosen up dirt, chemical, algae and bacteria build-up in every corner of your pool including your walls, floors, steps and waterline. 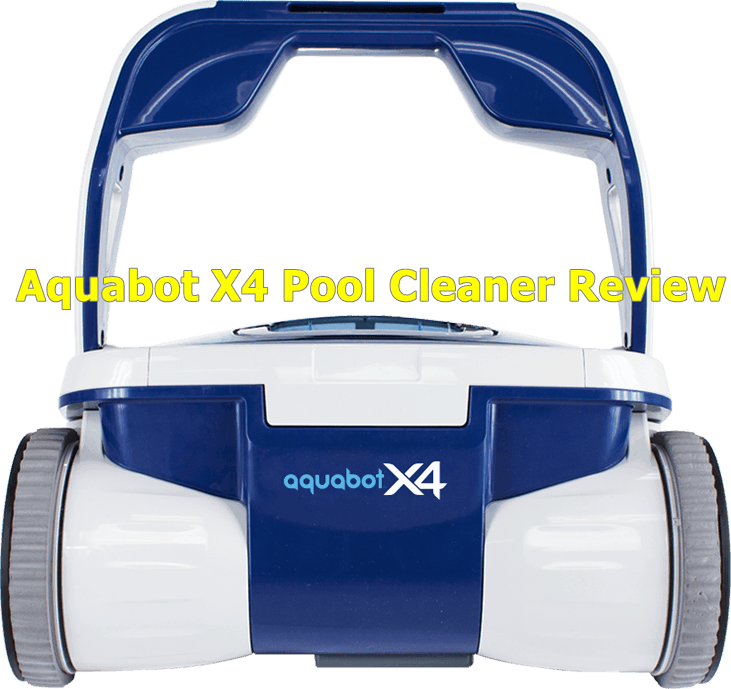 Not all pool cleaners can climb up 90-degree inclines but the AquaBot X4 can. Its 4WD system ensures that it can propel its four high-grip wheels, with minimal slipping across all surfaces – even glass tiles. You can also be assured that the cables will remain tangle-free during the cleaning period with the combination of an extra long 60-foot floating cord and the patented AquaBot Anti-Tangle Swivel. Most cleaners can quickly be dropped to get things started but lifting it out of the water is a struggle for many. AquaBot X4 has two quick-drain valves to prevent water build up inside the filters and make it easier to lift the robot. It also comes with a free Robot Caddy to help you transport and store your pool cleaner conveniently. Another proprietary feature of this pool cleaner is it AutoX Pool Mapping. This technology sizes up the pool and plans the most efficient cleaning cycle for your pool based on its dimensions and surfaces including steps. It guarantees that it won’t miss a spot. Yes. This robotic pool cleaner can be used on both in-ground and above-ground pools. It can also cover any surface and terrain. Yes. The Aquabot X4 features an advanced rotating micro-brush that helps loosen dirt, grime, bacteria and algae build-up on your pool’s waterline, floor, walls and steps. It sports a clever combination of a big suction intake and two micro-filter baskets with a 190 cubic inch capacity. Therefore, users can surely benefit from its ability to take in the smallest to largest debris and leaves. Definitely. The programmable control panel has options for the pool cleaner to run automatically every after 48, 72 and 96 hours to ensure that your pool remains as spotless as possible. It is highly recommended that the pool cleaner is taken out especially when the pool is being used for everyone’s safety. The Aquabot X4 may look simple, but it is loaded with surprising features. It houses in it the proprietary features of AquaBot pool cleaners like the finest 2-micron filter system, the anti-tangle swivel and the rapid cleaning system. But it was packed with more upgrades like the 4WD system, AutoX pool mapping and the 190-cubic inch filter baskets. This is indeed an impressive machine that will surely eliminate the need for professional pool cleaning services. With the robot's programmable and automatic cleaning features, you will surely keep your pool and pool water at its cleanest state without straining your pool pumps and breaking the bank on electricity costs. Get back to spending more time swimming and exercising on your pool and stop spending too much time on cleaning. It’s about time to get yourself an Aquabot X4 and reclaim the fun in your pool!